A simple, yet powerful, bulk searching tool. “Bulk search” for domain names is very useful when you’re scavenging for domain names to hand register. I recently used Uniregistry’s search to look up both individual keywords across multiple TLDs and multiple keywords across a single TLD. 6 results are returned. You can click “More Suggestions” to see a full list. 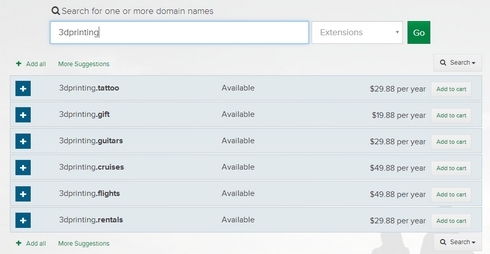 This is a great way to search for popular keywords across multiple new top level domain names. You can also check a full list of keywords against one or more TLDs quickly. For example, if you have a list of keywords you like and want to see if they’re available in .link and .xyz, just paste them into the box and select these two TLDs. There are lots of bulk checking tools out there and they all have their merits. I like Uniregistry’s for its ease-of-use, especially across multiple TLDs. Just tried. Works fast. Quick question though: 3 names were available and when I checked them on GoDaddy for the same names, they weren’t ? I ran into that problem on one search, but it was on a launch day so it’s possible they were being registered at the same time elsewhere. I imagine to be as fast as it is it’s not exactly real time. Curious, I signed up for a Uniregistry account, asked for nothing more than a email and password, sent me an email and that’s it. Do I have to reg a name there to get an account going? Id like to switch everything over there from Moniker now but a bit confused. I tried again by selecting a name to reg, using email and password to sign up, shows one in the cart and that’s it, no account info, email, nothing. It is literally impossible to sign up or buy anything for me. @thelegendaryJP, all of the other information will be collected on check out. thelegendaryjp, Uniregistry accounts are FREE! Just click on the “Transfers” menu item at the top of the page and put your names in the box with the transfer code from your current registrar and as long as your credit card info is up to date you will not have any issues. Feel free to e mail me (sevan@uniregistry.com) or call me (345 939-9933) and I will be happy to go over the entire process with you. I see it now, many I am horrible at the computer lately lol Manythanks Sevan, time to see how gently Moniker will be running this week. Sad when your domain portfolio is a hostage to a degree. I registered a handful of .xyz domains at Uniregistry this week. Nice, clean system. 2-factor authentication using Google Authenticator is a plus. I’d want it to be part of Afternic Premium before considering it as a full-time registrar.